Cost/Price: from 1 000.00 ZAR per day per person sharing includes accommodation, all meals, training course per day and yoga and meditation classes twice a day. Description of the Retreat:Pathway’s Country Yoga Retreat is an escape from everything happening in the world to a tranquil space where one can simply just be in stillness, contemplation and reflection. Between rolling green hills overlooking serene dams you can unwind relax and rejuvenate out in the country at this beautiful sanctuary. 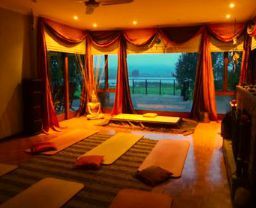 We host Hatha Yoga Teachers Training Certification, a variety of spiritual workshops and Yoga and Meditation classes. Salute the sun and moon under South African skies on our outdoor yoga deck. 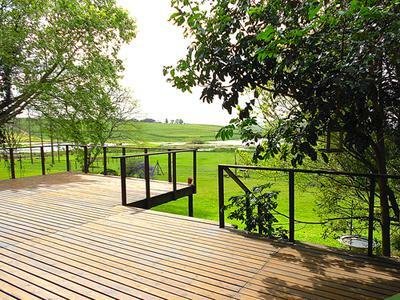 The venue has breath taking views and offers nature walks, meditation gardens and an abundance of bird life. Other activities in close proximity include Game Reserves, sky diving, wellness spas, hot air ballooning, mountain bike riding, beach yoga to name but a few. Instructor name and bio: Jennifer Fitzsimmons is the founder of Pathways Country Yoga Retreat based in Kwa Zulu Natal, South Africa where she hosts Yoga Teachers Training Certification, a variety of spiritual workshops, yoga retreats and classes. She is the author of her published book Pathway To Wellness. As a qualified Life Coach she specializes in transforming lives in wellness and fulfillment. Jennifer is a qualified and registered Yoga Teacher through Ishta School of Yoga and Health. She is also a qualified Kundalini Yoga Teacher (as taught by Yogi Bhajan) through 3HO and teaches both styles. Jennifer is also a full member of The Yoga Teacher Fellowship of Southern Africa, thus the International Yoga Federation; she is also registered with International Kundalini Yoga Teachers Association and 3HO South Africa. She obtained a full distinction, Life Coaching Diploma through The Life Coach Institute UK. Jennifer has been practicing Yoga for 18 years and teaching for 15 years. She has also trained teachers for the last 11 years. What's included in the cost of the retreat: accommodation, all meals, training course, yoga and meditation classes twice a day, retreats in excess of 7 days include a Wild Life Game Safari, beach yoga and a visit to a farmers market. After about 15km you will pass a Caltex garage on your left at the Eston cross roads – CONTINUE along the R603.